This is the 1999 JC Tritoon that I’m selling. 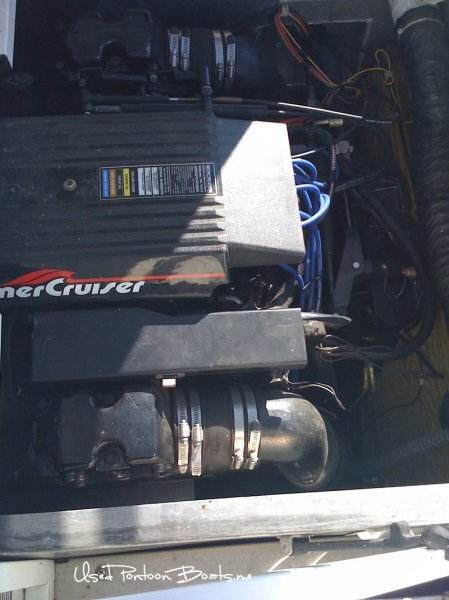 It runs great and with a inboard Mercury 350 Magnum Multiport fuel injection engine, this baby delivers 300hp! About seven years ago I started my search for the perfect boat. I wasn’t sure what boat I wanted. 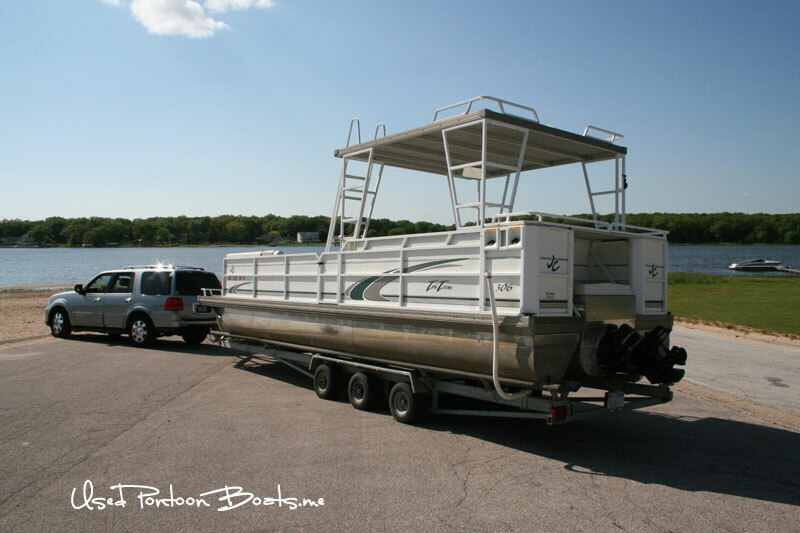 Having visited many boat dealers only to leave stunned by outrageous prices and feeling as though I survived a shark attack, I decided to consider used pontoon boats. Two years after starting my search, I noticed a pontoon boat flying through the water at incredible speed; so fast that it was actually passing regular boats! I knew then I was narrowing in on the right boat! 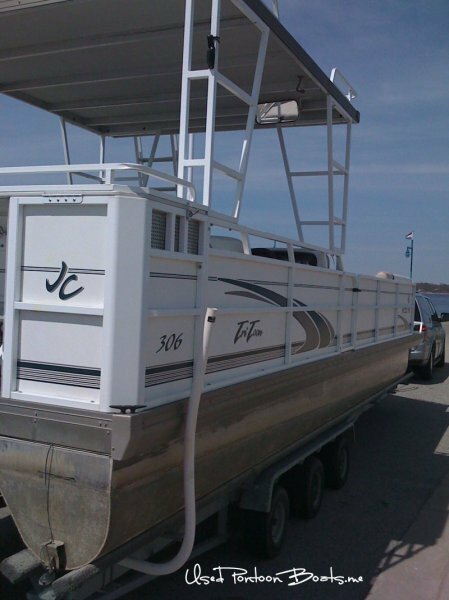 I caught up with the owner (turned out to be a neighbor) of the pontoon boat to find out exactly what made it so fast; turns out, it was JC Tritoon and I quickly received a tongue lashing for calling it a pontoon. My neighbor told me that although his boat was fast, he noticed the flagship of the Tritoon line, a 1999 JC Tritoon 306 had just popped up on eBay and recommended I buy it. 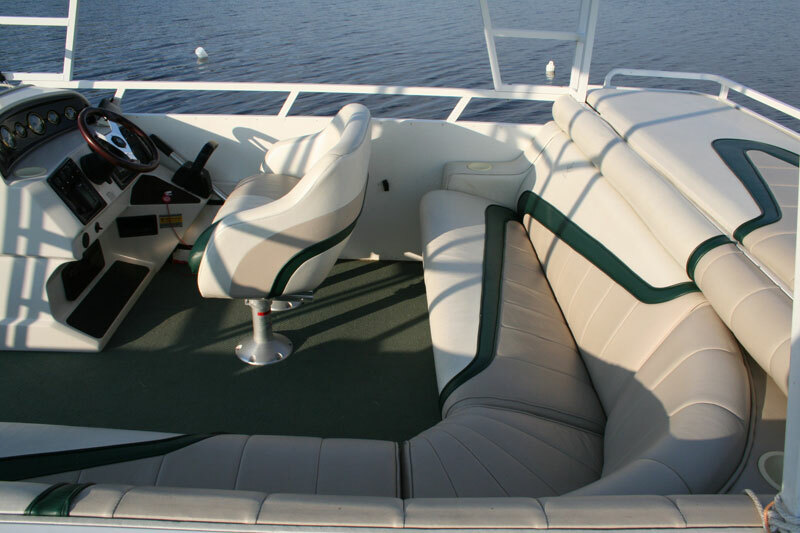 The 306 is a 30 ft party boat powered by a built in 350 Mercruiser that fits over 20 people and comes with a hardtop that also serves as a sunning / diving platform. I can’t tell you how many times I’ve caught up and passed boats that you would think should be able to leave a deck boat in the dust; the confused looks are most rewarding (yes, I admit it…). Since purchasing the Tritoon, I’ve had a blast; unfortunately, my wife and daughter can’t handle anything faster than a few miles per hours on perfectly calm water. It doesn’t matter how stable the boat is, a few waves or too much speed and they begin to get nauseous. I’m also new to fishing and have fallen in love with the sport. It doesn’t matter how big the waves are or how cold it gets, fishing is my new form of meditation. 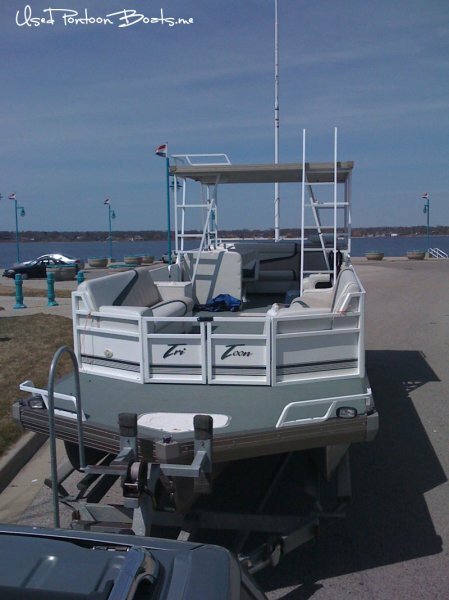 My ideal boat will allow my friends and I to easily manage down riggers, fish in cold (covered top with heat), and have a deep V to handle the big waves of Lake Michigan. It’s time for me to sell my boat. The JC Tritoon was $60,000 new, I paid $28,500 when I purchased it, have maintained it well and am now selling it. 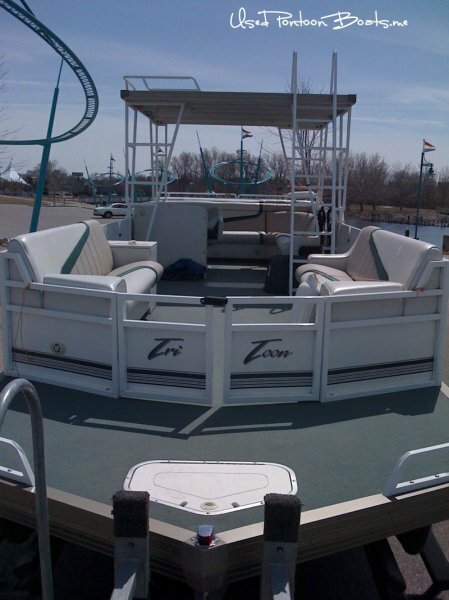 If you want the fastest pontoon (Tritoon) on the water (40 mph! 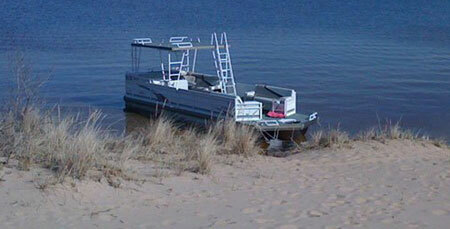 ), the ability to pull multiple water skiers at once, then come visit and let me show you what this party boat can do! I promise it will be a ride you won’t forget! 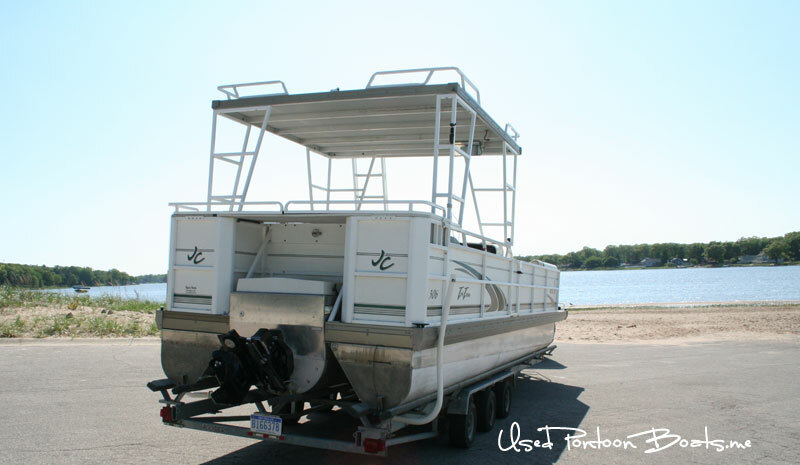 This 30 foot long powerhouse comes with a custom made cover and hard sun top (diving platform) makes this the best sun boat on the lake. 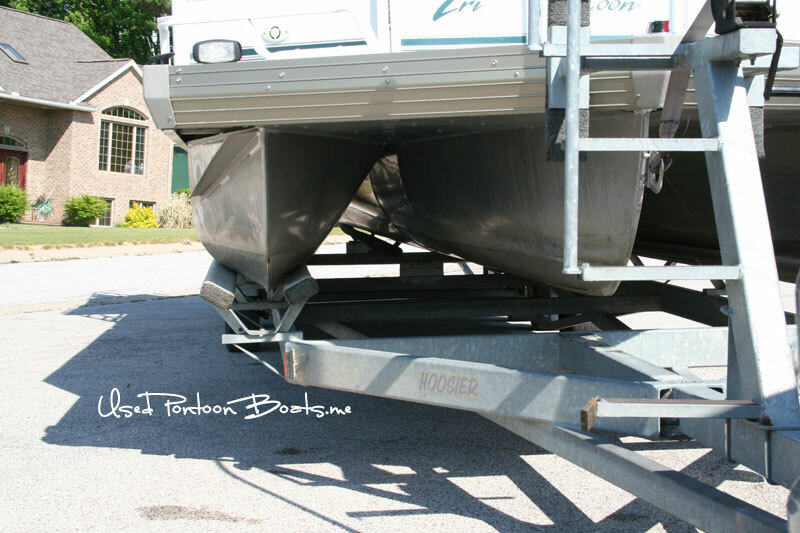 A Hoosier triple axle trailer is used to transport this party barge from lake to lake. The 306 is the flagship of the TriToon line. Truly the best riding of all the JC line, and that is really saying something! With the v-8 in the stern, you can glide across the roughest of inland lake chop. JC has been building the TriToon for over 25 years. 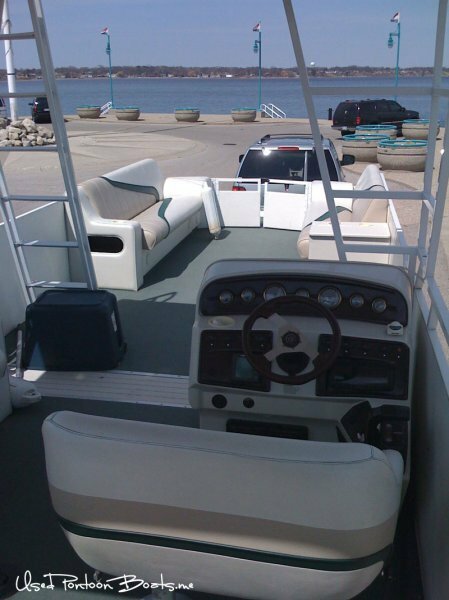 In fact, the word”TriToon” is a registered trademark of JC Manufacturing, Inc. With it’s unique unibody tri-hull construction and full planning capability, it offers deck boat performance combined with pontoon boat comfort. Have guests that fear motion sickness? A TriToon, unlike your standard pontoon, is much more stable and easily cuts through waves making for an enjoyable ride! 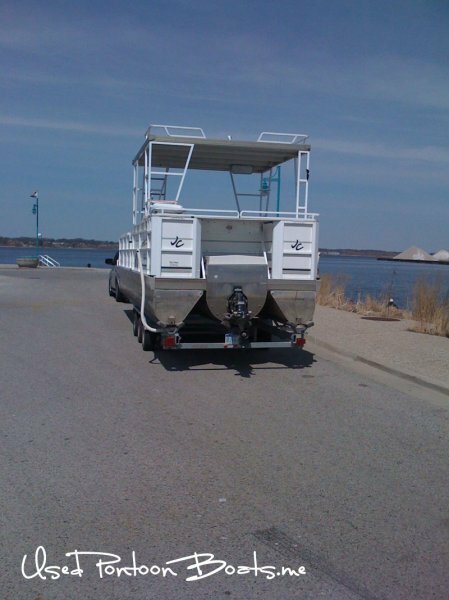 Preferred option package (includes L-group, bow lounges, kidney shape table, 18 gallon reserve tank, pullout stereo (601) w/4 speakers, stern boarding ladder, upright cooler, docking lights, courtesy lights and blinkers (for that added effect). I’ll post more pictures once I can remove it from storage. This is located in West Michigan and I’d be happy to take you for a spin! The captain’s seat is beginning to wear at one of the seams. You can see the picture below – it’s not that noticeable, but something that is going to need to be repaired at some point. On a small section of the boats side, the paint has peeled – touch up paint should do the trick. The right frame of the upper platform has a couple of welds on one leg that have come undone and need to be re-welded. This has been like this since I bought the boat and I have not noticed any instability when hanging out on top. I ran over something (wood, rocks?) when I first bought the boat and insurance replaced the lower unit. I replaced the prop with a special prop that will strip rather than damage the lower unit should you repeat my mistake (a lot less hassle and easy fix); I have a spare prop as well, along with the old one as a reminder – everything runs perfect. 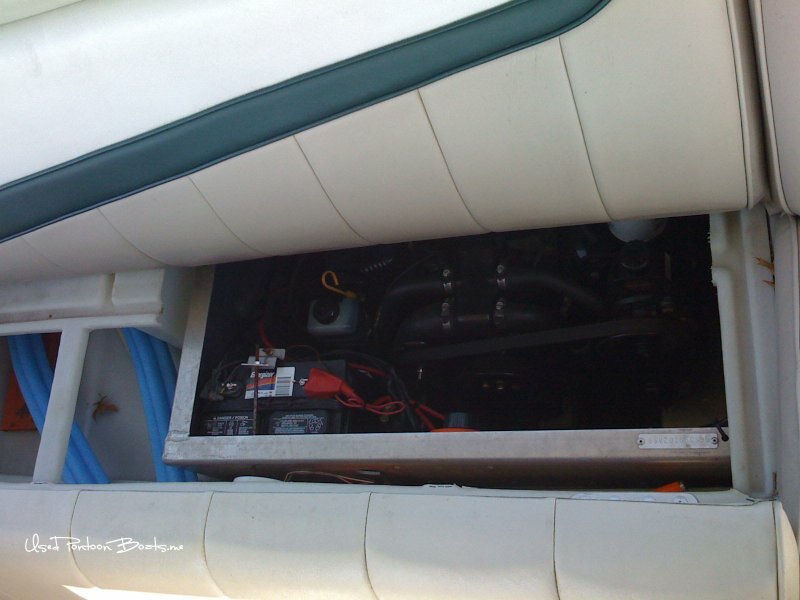 That’s it for any surprises – The boat is in great shape and most importantly, the engine runs perfect. The book assumes a 190hp; upgrade bumps the horse power up to 300hp! The book assumes a Bimini top, upgrade includes the hardtop. Book doesn’t factor the trailer into the picture. These are the correct values, so make sure when you are pricing out the boat, you include all the upgrades / premium features mentioned above. It’s truly a unique boat – Chances are, you won’t find another tritoon like this on your lake! You can contact me by leaving a comment and I’ll drop you an email. All comments are moderated, so your contact information won’t appear on the site. The captain’s seat had a section where the seam was coming apart – it’s very noticeable now. I put a beach towel on it to protect from further damage. I have been having sporadic problems with the engine – It sounds like it’s running out of gas but I still have power. I was told there is water in the gas and that I need to change the water separator filter. I did this but still have the problem. I asked a local boat mechanic to take a look at this, and he replaced the spark plug wires, rotor cap to no avail. He then suggested I replace the ignition module – I picked it up from him and replaced the module but no luck. He now thinks that it’s the electronic control module, but that is $1,000. If that fixes the problem, I’d buy it, but he is not sure and once I buy it, I can’t return it. He does not have an ECM tester, so he suggested I wait until he gets a boat in with the same ECM and he’ll (after asking the owner) try it in mine and see if that fixes it. If so, then problem solved. I talked with him today and he said it should be a couple of weeks and that boat should be in. I have a person ready to do the welding on the back sun-deck support arm that I have photographed. I plan on getting everything except the seat fixed before the end of the season (soon) but if you think you can do the work and want to negotiate it out of the price of the boat, I’m all for it. Note: It is sporadic; two days ago, I went out 15 miles into Lake Michigan and didn’t have any problem. The time before I went to White Lake and it sputtered a few times and then ran great. That is the latest and I’ll keep updating this website with more information as it happens. If you want to wait until I get everything fixed and find out what the problem is, great. If you want to look at it now and take it for a spin, that’s fine also, just let me know. As far as price goes, I would have to get an updated ABOS quote and we would go from there. Wow! I tested it yesterday, no wind and perfectly calm waters and used my Navtronics Boating App which said my top speed was… Get this… 30.6! I kid you not – exactly the same as what you reported. I had a different prop and destroyed my lower unit since I last tested the speed. I now have a standard prop and am sure the prop I used before would not have given me that much of a speed increase. 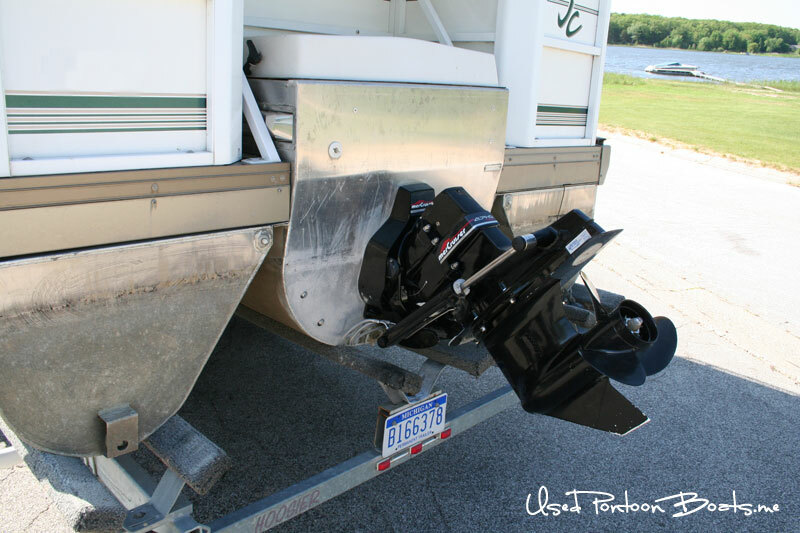 Did you ever have to replace your lower unit? Odd that they are the same speed! Feel free to remind me if I don’t update this comment by then. I own a 2004 306 JC Tritoon, my speed is 30.6 mph. You said it went 40 mph? I have been researching how to meet the manufacturer’s claim on top speed. We have same motor, 350 mag. I was wondering what’s your propeller set up? if your boat is still for sale, let me know, I want to come take spin. I’ll Bring cash with me. If this boat is all you say it is, I’ll buy it. Hi Greg, my trailer is in the repair shop. I brought it into Van Kam Trailer Sales & Mfg Co in Muskegon MI at (231) 744-2658 for repair which ran me $1000 – I used it twice not going more than 100 miles and it needs work again. I’m currently dealing with them to try and get them to honer their work, but it is taking a long time and don’t anticipate it being completed until just before I have to take out my boat. Sorry about that. 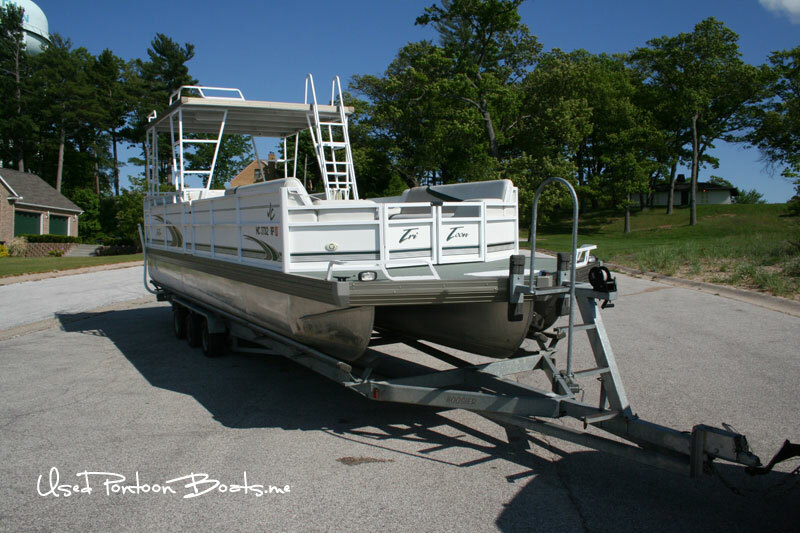 Just bought a used 28′ tritoon…no trailer…thought we would be able to rent trailer to get boat from point A to point B…finding that’s easier said than done! Don’t really want to purchase one as once we get boat to our lake the marina will take care of it from that point on. This leads to my question…thought I’d give it a shot…any chance you would be willing to RENT your tritoon trailer so that we can get our boat home? We are located in SE Michigan. Thank you for your consideration!! I would really like to take a look at ur boat. Hi Brad, no, not right now. I’m on and off with this, so if I decide to put it up for sale again (which I just may do as my wife wants a smaller boat), I’ll post here. Thanks for checking! I will do that Cliff – have a great 4th! If you get the urge this fall e mail me. Prefurably before you put it up for storage. did you sell it? would like to come and check it out. this is the boat for me! Is this boat for sale ? I’ve got it out of storage and in for a tune-up. It’s tempting, it’s so big and storage is a pain for me now, but I know the summer fun will be worth it all! If I change my mind, I’ll write. Is it still for sale? I have CASH in hand. Just let me know where…..
Did you sale the boat yet ? Very interested. Contact me if it is still available. Give me an email and i will send pic. I’m not familiar with the boat you’re referring to, can you give me more details? Year, speed, etc – is it a fishing boat? Would you ever consider trading for a 30′ performance vee? My families needs have changed and your boat could be perfect. 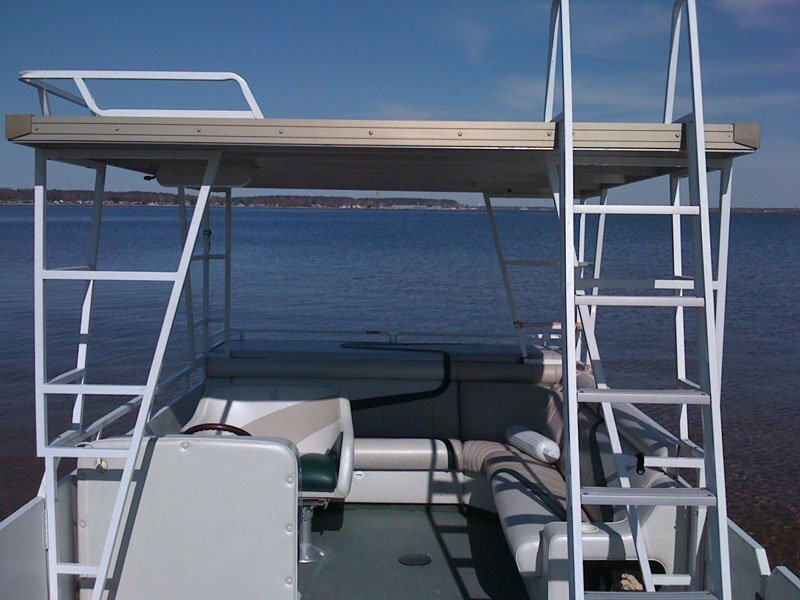 Is your pontoon for sale? Please contact me. Where is it located? No, the tritoon is not for sale (at least not right now : ) – I’m redoing all the seats and figured I might as well keep it rather than give it away. Thanks for asking and good luck on your search! Is this boat still for sale and if so, at what price? Am very interested in the tritoon if it is still for sale. I live on the west side of Wisconsin on the big muddy. Would make a great river runner. If yours is not still for sale maybe you know of other tritoons along similar lines for sale. Looking for a tritoon… Did you already sell? If it’s still for sale, where/when can it be seen? Thanks. Is your boat still for sale? Is your boat still for sale? I am looking to trade a 2003 100th Anniversary Police FLHTP Road king with only 16K. I broke the bike in and rode it one year as a Motor Police Officer. I bought the bike after using it one year on the force. Since I have customized the bike and have as much into it as I have paid for it. I also have a 19.5 1979 Bayliner for sale. My goal is to buy a Thirty Foot Tri-toon. Exactly as you have advertised. Let me know. If your boat is still for sale, can i get your number? Does anyone know where I can get a trailer for a 25′ tritoon? I need to get one asap. Same question, is it still for sale? I’m located in Ludington. Is your boat still for sale? Thank You. Could you please tell me if this boat is still for sale? Have you sold the boat yet??? Where are you located? So, I hope you are still alive and healthy, then, is your boat still for sale? 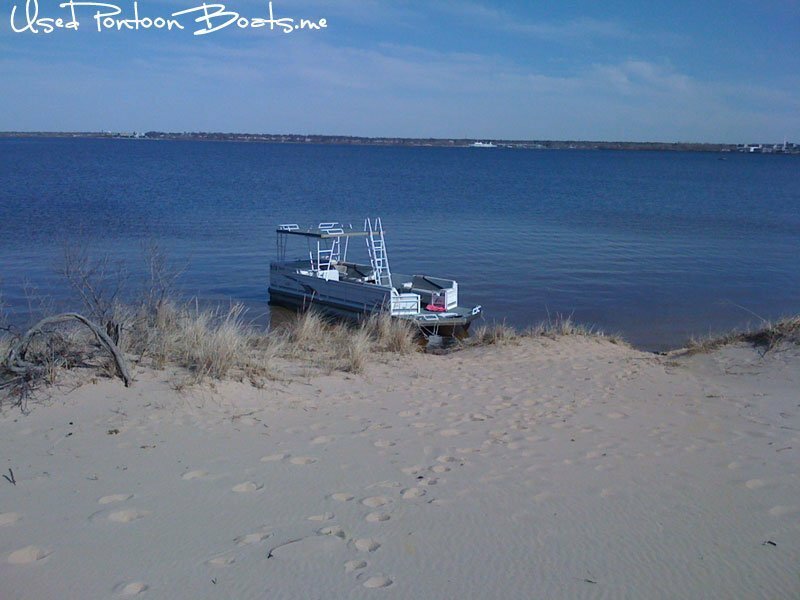 Looking for a boat like yours… Is it still for sale? How can I contact you? I pulled up to a location where there must have been 50 boats and we were the only one really having fun jumping off the hard top! We had people swim over and ask if they could join in on the fun. 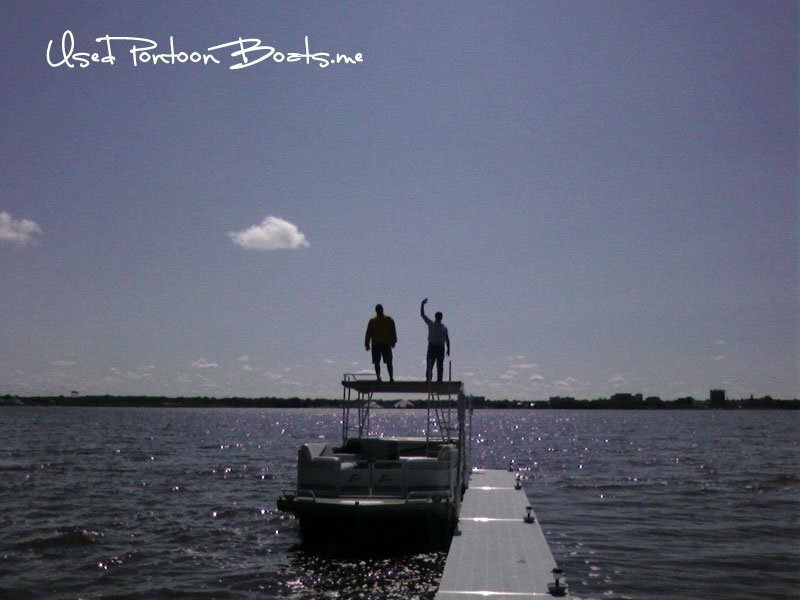 I had a friend once who owned a Tritoon without a hardtop – he said the hardtop was what it was all about – he was so right – It really made the holiday all that more special, so word of advice, when you do buy your used pontoon boat, make SURE it has a HARDTOP! You’ll love it! Hi is the boat for sale still???? How about toilet on the boat? Is boat still for sale–where ?? Well, I’m buying a boat. Are you selling this one or not? I’ll come right over and see it and will bring cash. Ball is in your court! Send me an email. I’m serious. It’s no longer for sale… I stored it all winter and now that summer is here again, were having a blast. See my comments above – but in a nutshell, the amount I could reasonably ask for and receive is not worth it to me, so I’ve decided to keep it. Sorry if I was not clear on that. I’d like to see your JC, how can I arrange that? Where is it? Yes, I believe the problem is fixed for good. As I mentioned above, it was a distributor rotor, a $10 (or so) part that cost me more than you can imagine! It’s at my dock now and all is right with the world :) If it was for sale, I’d ask what ABOS would give me. is this boat still for sell and have you fixed the engiene problem for good. what isyour lowest dollar you will take? I apologize for missing you – I take it out of storage next week and am looking forward to it; I found that in this market, everyone seems to looking for the deal of the century. I had a couple come out and look at it, they loved it, but offered a price so low it was disheartening! Others have been interested, but again, their offers are something you might make to someone that needs the money badly and has to have it now. After one too many of those types of offers, I’ve decided to keep it. Obviously you are still in the market for a boat and if I can offer one word of advice, it would be to focus in on the tritoons (JC or any other) and look for one with a kicker if you’re going in a big lake (Lake Michigan here…). I sumitted request on 4/22/10 about avaiablity & contact information if its still for sale & have not heard a word as of today 5/11/10. I’m interested in the boat & have some questions. If the boat is still avaiable let me know how I can contact you to go over my questions. Hi, is your pontoon still for sale? Great looking boat is it still for sale? Thanks for the “audit website”, from pc audit to tritoon! Jim, is your boat still for sale? it looks great. I’d love to discuss it with you. What a riot! I went from your other great website, “AuditMyPc.com” to this one because i love fishing and boats. I have been reading with interest every word posted here and would have to say that i think you have a keeper. Both the website, and yes your boat! I almost cried when i sold my boat, and have often thought back about just how much fun we had at the lake when I had it. Hard to replace now, I had an 26 ft Sea Ray with the cuddy cabin that slept 6 pretty comfortably, and too had the full camper canvas package, which was really handy. Not for cold weather mind you, for monsoon season here in Arizona. The weather can change in 30 mins from wonderful to wild and it always kept us dry. Great work on both of the websites, and remember, summer will be back before ya know it, and your family is going to want to hit the water. Throw the mooring cover on, and sit back and smile till then! From sunny Arizona, I say have a great day!! I brought the pontoon into a big pontoon place yesterday. The first thing the parts guy suggested as the kill switch. He said that it can come loose and cause this problem. I already had it on the trailer and didn’t want to take it back home and mess with it – he said they would look at that first. Your suggestion is an excellent one and I’ll call them and ask them to do this as well – I’m not getting it repaired there, it’s just that they have a tester for the ECM. Thanks for taking to share, it is GREATLY appreciated! I happened upon your site, not in the market for a boat, but I had a similar engine related problem with a GM 350 engine in my 2002 GMC Van. I am not a mechanic, but I do like to tinker with my own vehicles. I had replaced the ECM ($600), mass air flow sensor($450) and several other components to no avail. I had spent upwards of $3k at a local GM dealer and the problem was not resolved. I spent 5 hours @ $90/hour at my dealer and they did test afte test. Their best guess was the heads needed to be rebuilt($1500 per side). I did not do it. The engine finally stopped working one day and I ended up pulling the distributer and the drive gear was worn away. A $62.00 part that took ME 15 minutes replace, resolved the problem. All the diagnostic equipment on the world will not diagnose a worn gear. It will only diagnose symptoms and relate them to an electronic failure. Have your mechanic take a few minutes to pull the distributer and rule out this possible problem. I have a 45′ tritoon that I want to sell. What do I need to do to get on your site? let me know if your boat is for sale and asking price. I have 26 foot jc without hard top would like a little bigger and hard top. Jim, is your tritoon still for sale. I am located in Spring Lake, Michigan. Send me an email. I’m not sure on the price – I have try and get a quote from ABOS again. Still waiting for the mechanic (who is still waiting on the boat I discussed above to come in) so that we can swap out the ECM. My daughters friend’s father is a mechanic as well (cars) and he thinks it could be the mass intake valve (or something like that) and all I need is to clean it out. He was going to come out late last week, but it looks like it might not be until next week. I called a welding guy who charges $95 per hour (he said he’d make it right (price that is)) for fixing the broken weld in the picture above, but I have yet to hear back from him. I’ll keep the site updated as things happen. Winter is approaching, storage is going to run me $800 and I’ve used it a lot less that I had hoped. Although every time I take it out, I love it, it’s too much for just my wife and daughter, so I’m putting it up for sale. I’ll post some updated pictures soon and I’ve written everyone that has asked to be notified. If you change your mind i too would like to purchase this boat from you and i will take it right now if you are still interested in selling it. Please contact me if you decide to sell in the future. This boat is exactly what my wife and I are looking for. We recently sold our Mastercraft X2 because we have a 2 year old and are looking for a boat that we can take the whole family out on. 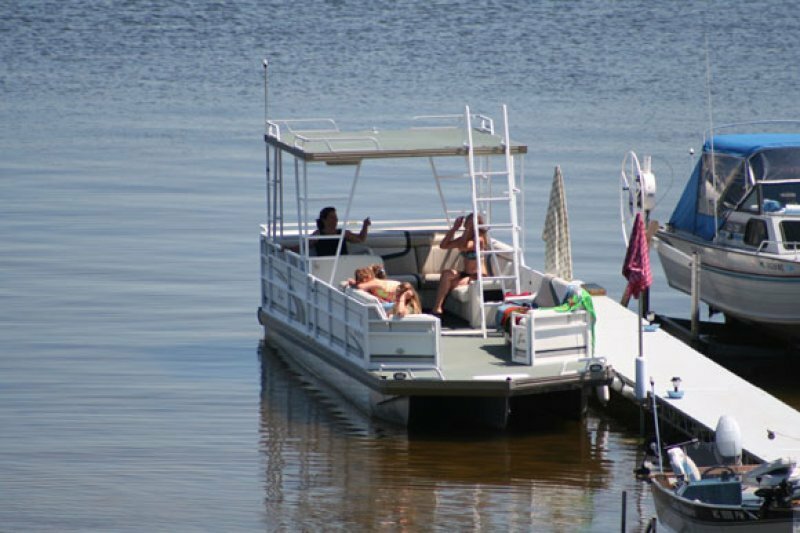 Is this pontoon still for sale? The ABOS blue book shows my Tritoon to be 3400 pounds. I didn’t see the weight in any of my manuals or documentation. It’s all aluminum, so it’s a lot lighter than one would think. Trailer and Tritoon is 4,615 pounds. 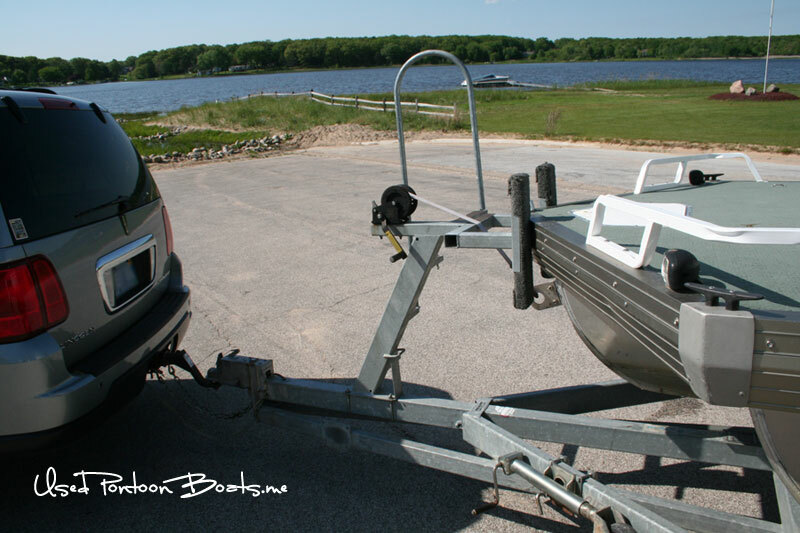 I am a little limited on towing capacity on my truck – only 5000 pounds. Any idea what your weight looks like (dry or wet)? Also, can you give me the city name so I can figure out the drive? The boat is still for sale. The last offer I received was far too low and it’s not a case where I need the money, but rather that it’s a lot of work keeping it clean and docked. I live on a section of the lake where the wind is extremely strong at times and waves are heavy. If I lived on a smaller lake, I could have a covered dock and not worry about keeping it clean or a storm breaking the ropes. I love the boat and now that summer is here, I find I’m second guessing myself (again). If I receive a decent offer, I’ll sell, if not, that’s OK to. Your boat and website is awesome! Loved the video. I’ve never seen anything like your boat, but can imagine it would be perfect to fish from and take my kids with me for some skiing. I’ve been seriously contemplating buying a pontoon for the family for awhile now. I’m assuming it’s still for sale? Good questions and yes to both. The trailer is a Hoosier Triple Axle with less then 700 miles on it. Gas tanks hold a total of 101-150 gallons and Beam is 8.5 feet. 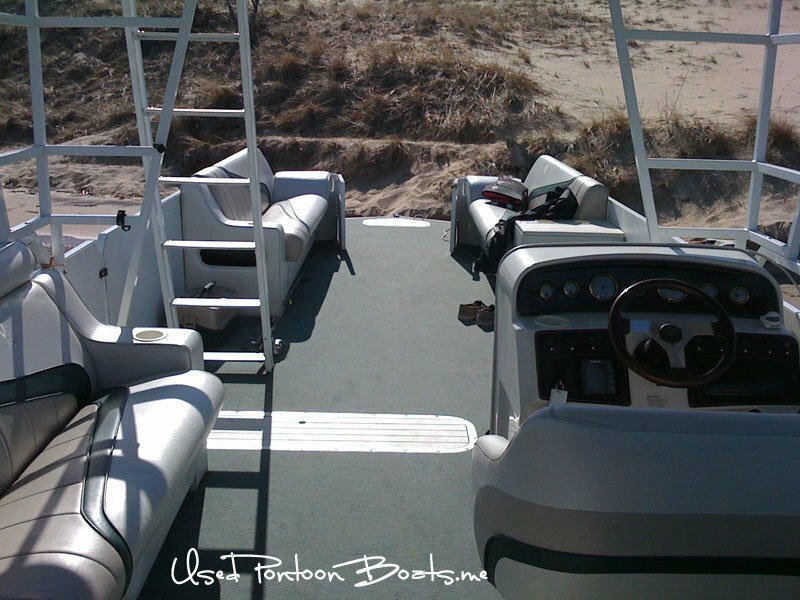 Does your pontoon come with a cover? Does it come with a trailer? I took pictures of the items that you were concerned about. You presented some good questions that others may inquire about so I’ve added them to this page for everyone to see. Yes, it is for sale. Sorry for the confusion: I thought about selling it last year but never did anything more than put it up on my site – Now that I have this site finished and the warm weather is just around the corner, It time to get it listed. I’ll send you my contact information. I am interested in Your JC 306 if it is still for sale. Can a canvas enclosure be added to the boat. Lots of bugs where we are. I sent you my contact information. 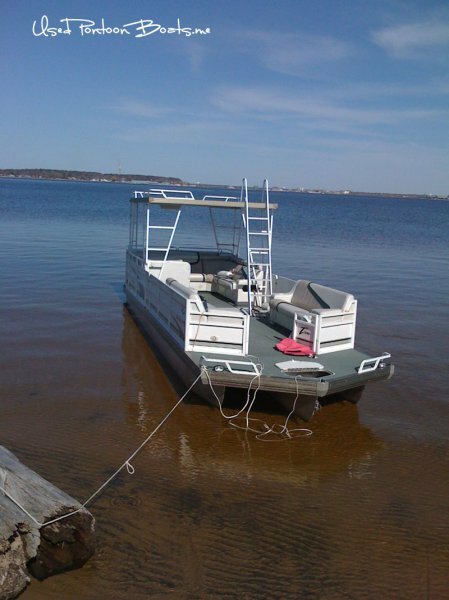 I don’t have a boat lift; it stays in the water tied to the dock. Every so often I clean off the pontoons – it’s fresh water, so it’s easy to clean the algae off. I also have a cover for the boat. Does your tritoon come with a lift? Please contact me. I would like to see it in person. This pontoon has never seen salt water. I have no idea what it would take, if any, to run it in salt water. It’s only been run in fresh water. Salt or fresh water use? It is still for sale. All I have done so far to advertise the boat is to create this site and get it running. Last week I finally got around to posting the pictures and I feel everything is ready. My plan is to start with Craigs List and refer back to this site in the post, then eBay, then others from there. When I do sell the boat, I’ll make sure to clearly note that on this site. Thanks for asking and I’ll send you an email as well. Has this boat sold ?